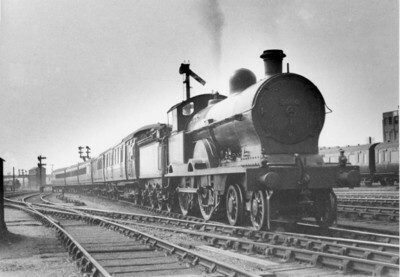 The engine is a rebuilt Precursor, LMS no. 5300 Hydra and the shed plate looks like an LNWR one, so pre-1935. The train is approaching Rugby from the North on the up Birmingham line with Rugby No.5 cabin and the wooden bridge in the background. The first two carriages are LNER, so I would think that these are through carriages from Birmingham - Peterborough - Harwich. This in turn suggests the 1600 from Birmingham, 1648 dep. Rugby. (1933 times). This looks like the north?/west? end of Rugby station. In the distance is the well known footbridge. On the right can just be seen the factory buildings of what became known as B T H. Probably taken in the mid/late 30s as a Stanier loco is also in the picture. The leading LNER vehicle poses a problem as to what the working is as I do not have a marshalling circular for the period. I believe this to be Rugby, looking northwards from the end of the Midland Counties bay. In the distance is Signal Box No 5, with the 'Wooden Bridge' behind. To the right is one of the BTH buildings. The train is stopping at the up platform.